No one ever said the best product would always win. No one ever said it would be fair. It’s a sad reality that the fine folks over at HTC must know all too well. For years now, HTC has been making some of the most beautifully and painstakingly designed smartphones in the world. Whether it was the HTC One X or last year’s HTC One, the Taiwanese manufacturer knows how to make phones that not only feel good in your hand, but are also forward-looking in terms of design. But throughout it all, the binary struggle between Samsung and Apple has been the story that has dominated the smartphone industry, leaving HTC on the sidelines. The way they’ve been constantly pushed out of the spotlight has left a lot of analysts wondering if this year’s HTC One is their swan song. Is the HTC One the device that will break through the paradigm? As stated above, HTC is a company that has been known for its impeccable hardware design—especially in its flagship devices of the past couple of years. This year’s HTC One doesn’t make many dramatic departures from the last year’s model (which remains a stunning piece of hardware design), but still manages to update the line in a way that feels fresh. With this year’s One, HTC has pushed the screen size up to 5”, although it doesn’t feel significantly larger in the hand than last year’s 4.7” model, and converted the entire body into a single unibody aluminium shell. The result is perhaps the most robust and high-end feeling phones in Android history—especially when you take a look at the other competitors in the market. Along with the unibody aluminium, HTC has covered the device in a brushed metal texture, which is the only change from last year’s model that doesn’t agree with me. Despite all the work HTC has done in refining the design of the device, the texture they chose still just doesn’t look as nice as the back of the iPhone 5s or even last year’s HTC One. Unfortunately, the look only gets worse when you look at it in the gold or darker grey models. Fortunately for us, you’ll be hard-pressed to find a flagship smartphone these days that doesn’t have a full HD screen that will knock your socks off. The HTC One certainly isn’t an exception because the display here looks fantastic. It’s a 5.0” 1080p display that comes in at a whopping 441 ppi (pixels per inch), which just so happens to be higher than any other 5.0” smartphone out on the market. The One uses a SLED (Super LED) display, which makes for a bright, balanced, and color accurate screen. Some will certainly prefer the high contrast and deep blacks of the Galaxy S5’s Super AMOLED displays, but I found the HTC One’s more balanced approach to really do the trick. When it comes to some of the HTC One’s other features, expect nothing but the highest quality. One of the One’s biggest bragging rights—perhaps the one thing that no other smartphone has been able to reproduce—is the front-facing speaker grill. By moving the phone’s soft buttons on the display itself, HTC has made even more room for these two fantastic speakers, which sound better than ever despite having removed their “Beats Audio” integration from last year’s model. The other cool thing HTC has done with the HTC One hardware is make it water resistant, which sounds gimmicky, but is actually really helpful. Having jumped on the bandwagon that Sony started with the Xperia Z last year, the iPhone is now the only major flagship smartphone that isn’t water resistant. The last thing to mention about the HTC One’s hardware is the camera, which was the 2013 model’s only big hang up. Unfortunately, HTC hasn’t done the necessary to legwork to ensure that this year’s model takes care of that issue. In fact, the new HTC One still features the same 4.0 megapixel shooter—a long ways away from the 13 MP shooter on the LG G2 or the 16 MP shooter on the Galaxy S5. And yes, while it is certainly true that a higher megapixel count doesn’t necessarily equate with better photos, the camera on the back of the HTC One just does not do enough to make up for the difference. Without getting too bogged down in the details, the One uses a larger image sensor that they call “UltraPixel”, which allows the camera to capture up to 300% more light. The result is that I had great experience taking low light photos with the One, perhaps only bested by the iPhone 5s’ low light performance. If you’ve always been frustrated with smartphones’ low light performance in the past, you’ll be delighted to see how well the HTC one does. Unfortunately, the daylight shots this camera takes don’t fare quite as well. It’s when the sun is out that I came very aware of how low the megapixel count really is—especially if you try to do any zooming whatsoever. It’s strange that HTC thought they could skimp out on upgrading the camera this year, especially considering how strong the cameras are Android phones are from the likes of Sony, Samsung, and LG. Despite trying to stay up to date with their new Lytro-like focusing feature, the camera still feels like old technology—because it is. 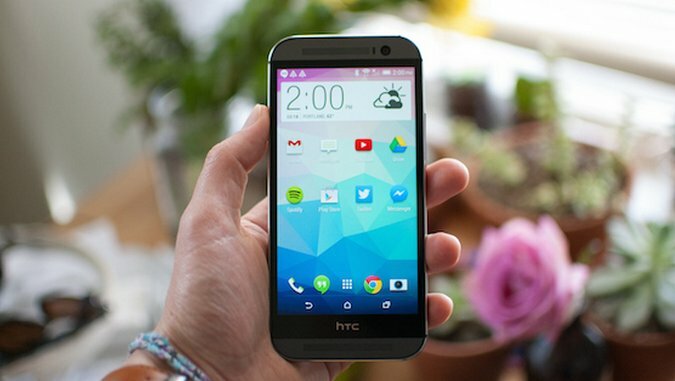 SOFTWARE: HTC Sense keeps getting better, but is it good enough? HTC Sense is the company’s Android skin, now arriving in the form of Sense 6.0. This time around, the UI has been built around KitKat, the newest version of Android—and it is, by a long shot, the best version of HTC Sense yet. Even so, there aren’t any drastic changes to how the UI works from last year. You’ve still got HTC’s fairly minimalist set of icons and distinctive widgets, the vertical scrolling in the App Drawer, and BlinkFeed. BlinkFeed was a new feature in HTC phones last year and it’s only gotten better this time around. It functions as a comprehensive social media and content aggregator that works perfectly as a time waster while waiting in line. They’ve scaled back some of the Flipboard-esque visual cues in BlinkFeed and made it a really smart addition to the Home Screen. In terms of the look and feel of the HTC One’s software, HTC has made small changes to update the UI, including removing some unnecessary shadowing and gradients, flattening the design elements, and even throwing in some transparency. It’s nothing too drastic, but they are small steps toward making HTC Sense more and more like stock Android. While I’d probably still rather be using KitKat on a Nexus 5, I can’t help but admire HTC’s attempts to reduce clutter and modernize their UI design, especially next to a Samsung Galaxy S5 or an LG G2. HTC Sense has quickly become my go-to Android skin, making the experience of using an HTC One a highly enjoyable one. As with all Android devices that aren’t made specifically by Google, there is always the issue of bloatware. It’s an unfortunate thing that I always find myself going back to when reviewing Android devices—but it’s not an issue that is about to go away anytime soon. I won’t go into the details as I have many times before, but the basic problem of having three or four options for things like internet browsers, photo albums, cameras, and app purchases can really ruin the experience for someone less familiar with how to properly set up an Android device. I’d love to recommend Android phones to less technically literate people because of the easy integration with other Google services, but the bloatware issue always has me directing people back to iPhones. However, aside from a few annoyances like the way Sense sometimes handles scrolling, there isn’t a lot to complain about on the software end of things. HTC has built a phone on both the inside and outside that knows exactly what it wants to be and has been executed upon with a clear embodiment of that vision. As I stated above, however, the best phones don’t always win—and in this case, I just can’t help but assume that the HTC One will get lost in the fold in 2014. While companies like LG or even Google can afford to be nothing more than an alternative to Samsung, HTC simply can’t. HTC is in a position where their phones keep getting better, but their financial outlook keeps getting worse. In a world where Motorola has been purchased twice in the past couple of years, LG is rumored to release their next smartphone is an aluminum shell, and the newcomer OnePlus One is selling its unlocked phone for $299, the stakes have never been higher for HTC. And while they’ve delivered a product that is perfectly suitable to be your next purchase, it isn’t one that hits any milestones in a time when that is exactly what HTC needs to assure their relevancy in the future.